Yesterday the family ventured into JoAnn's Fabrics. Lynda was getting material to line the inside of her Girl Scout vest. As Lynda was choosing an appropriate bolt of fabric, I watched Hannah wander through the aisles of ribbons, buttons, sewing patterns, and all the Christmas ornaments and decorations. As Hannah tried to convince me that we needed some kind of Disney-themed ribbon, I was reminded of the many days of my childhood where I was in Hannah's position. 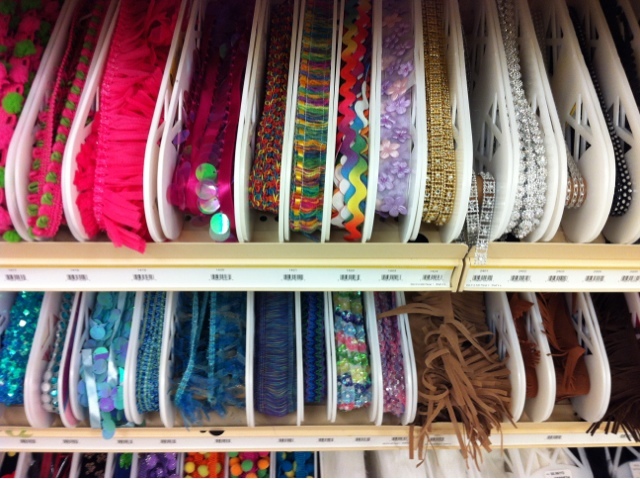 I was the one spending time in the fabric store while Mom searched the sewing patterns and the catalogs. This most often occurred when I was frequently visiting my orthopedic doctor in Albany, GA--and when Mom was sewing and knitting lots of clothes, sweaters, and blankets for us kids. There is just something so Seventies about the entire experience. The books, the buttons, the no-nonsense warehouse-y feel of the stores, devoid of flashy screens, music, or mod decorations. Just white walls, plain floors, and aisles upon aisles of do-it-yourself materials. 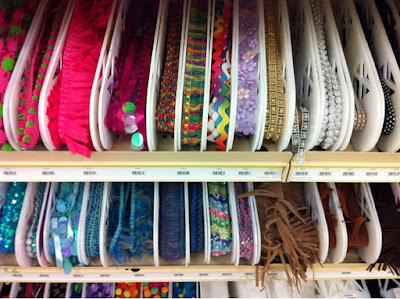 I actually enjoyed the rows upon rows of ribbons, buttons, spools of thread, and all the rest. Perhaps that is what I like about the Things Organized Neatly Web site . (Or maybe that is just a manifestation of my own neatness issues. No word yet on whether Hannah is similarly affected.